A number of factors have contributed toward the evolution of the Entity Framework (a technology used to map database entities to objects used within .NET application programs). However, one of the major factors is the way in which developers work. Not all developers work in the same way and not every situation requires the same solution. With this in mind, Microsoft ADO.NET Entity Framework Step by Step helps you understand how the evolution of the Entity Framework has been affected by these factors. It points out how the alternatives provided by the Entity Framework make your job easier by increasing the flexibility of the development environment. One of the more important evolutionary steps is the inclusion of three modeling techniques within the Entity Framework: Model First (where you create a database based on a model you define), Database First (where you generate a model based on an existing database), and Code First (where you generate a database based on the objects in an existing application without using a designer-based model). You can read about these three models and how they affect your application development in my recent article, “Choosing the Right Entity Framework Workflow.” The purpose of this article is to help you make the best choice in modeling technique for your next Entity Framework project. The article also points out the need to combine techniques at times to obtain a desired result and helps you understand some of the pros/cons of each approach. Of course, there is no wrong or right approach—simply the approach that works best for you. The Entity Framework is a necessary technology when dealing with the complexities of a large scale development. Modeling tools make it possible to understand complex interactions with greater ease and to explain those interactions to others who might not have development experience. In addition, you use modeling tools to document how objects in an application relate to the tables and other features of a database. Knowledge like this is incredibly important when working in a team environment where team members must communicate well with each other or the project is doomed to failure. Most importantly for the developer, using a modeling technology like the Entity Framework greatly reduces the confusion that can occur when developer moves outside the comfort of a familiar development environment. Of course, there is a lot more to be said about the Entity Framework and this article (and even my book) are really just a starting point. I always like to get the reader perspective about materials that I write. What are your experiences in using the Entity Framework? Let me know at John@JohnMuellerBooks.com. I received a few messages from readers recently asking about an error message they receive when trying to install the release version of Visual Studio 2012 on their Windows 8 system (I imagine that the same error will occur when installing on Windows Server 2012, but no one has contacted me about it). The error says that Visual Studio 2012 can’t install because the version of the .NET Framework 4.5 is wrong. Unfortunately, the error message isn’t very helpful. You can’t install a new version of the .NET Framework 4.5 over the top of the existing installation. In addition, you can’t uninstall the old version and then install the new version because Windows 8 requires the .NET Framework 4.5 for certain operating system elements. In short, there isn’t any apparent way to fix the problem. The issue will go away at some point because it originates as a conflict between the Windows 8 version and the Visual Studio 2012 requirements. Every reader who has had this problem is using a non-released version of Windows 8 (normally the RC version). You can’t install the release version of Visual Studio 2012 on a non-release version of Windows 8. I’m assuming that the same error occurs if you try to install a release version of Visual Studio 2012 on a non-release version of Windows Server 2012, but I’d like to hear if anyone has tried this out at John@JohnMuellerBooks.com. What concerns me about this particular error is that it’s one time where Microsoft could have (and probably should have) come up with a substantially better error message or provided some sort of Knowledge Base article on the topic. As far as I know, there isn’t any such article and developers are currently having to rely on community support to fix this problem. It isn’t the first time Microsoft has left developers wondering. If you ever encounter this sort of problem, please let me know about it. If I can confirm the issue, I’ll put together a blog entry about it to get the word out to others in order to save them a bit of time. I try hard to follow the latest developments in all of the technologies that interest me. Since my range of interests is large, sometimes it proves nearly impossible to track it all. So, like you, I rely on summaries of information at times. I’ve been working with Visual Studio 2012 quite a lot lately. Not only is it the tool of choice for other authors and the tool I’ll use to write books myself, but I also need to verify that the source code for my currently supported books still works. The new features in the associated .NET Framework 4.5 are of great interest to me, so I checked out an article about it entitled, “What’s New in the .NET 4.5 Base Class Library” by Immo Landwerth. There are a lot of welcome updates. For example, asynchronous programming won’t be as difficult in the future because Microsoft has taken measures to simplify things. You can read the article yourself to see how much better the new technique is. I’m sure that many developers will welcome the change because it will make it possible for developers to create asynchronous routines with greater ease, which should make applications considerably more responsive. Given that one of the five tenets of Metro programming is to be fast and fluid, it doesn’t surprise me that .NET 4.5 contains this sort of change. I worked through the example and even tried a few of my own and the new asynchronous support works great! However, I have to wonder what the cost of this new support is. It isn’t often that you get simplicity without the loss of flexibility. As I explore this new feature, I’ll let you know if I do come up with reasons to use the old approach (as nice as the new approach is). The new ZIP file support strikes me as something Microsoft added because everyone else already has it. Microsoft was late to the party with this one. However, the new support is quite welcome because ZIP files have proven to be a problem in the past. Not many applications can get by without this particular archive today. What I had hoped would happen is that Microsoft would build an extensible archive support feature that would support ZIP files, but would also make it incredibly easy to add support for other archive file types, such as JAR and TAR. Unfortunately, it looks like we’ll see one new archive file format supported at a time. I’ll need to play with the read-only collections to determine how I’ll use them. Right now, it appears that this new feature will see limited use in my applications (if I use it at all). The first two improvements mentioned in this post have a definite use in my applications and I’m welcoming them with open arms. What I’d like to hear from you is how you’d use this new feature. Let me know what you think about it at John@JohnMuellerBooks.com. Articles are problematic at times because the author often doesn’t have sufficient space to cover all of the details. I know that I’ve encountered this issue myself. The editor assigning the article might not have sufficient grasp of the material to make a good decision about it either. I wish that this article had been split into several parts because the author lists a number of miscellaneous improvements at the end of the article. If you read the article, make sure you check this list carefully because some of the improvements, such as Console.IsInputRedirected, Console.IsOutputRedirected, and Console.IsErrorRedirected properties, are quite interesting. I write a lot of console applications and utility application that provide a console interface. Having these properties available will make it possible for me to code applications that are more responsive to user needs. I’ve noticed that Microsoft didn’t provide a full number update to the revision number in this case and the minor upgrade number is warranted. There are some nice changes to the .NET Framework 4.5, but nothing so exciting that you should rush out right now and start implementing it in your applications. It would be wise to carefully add this update to your applications to determine when it provides a true advantage and when there is potentially a loss of functionality or flexibility that makes the update a bad idea. 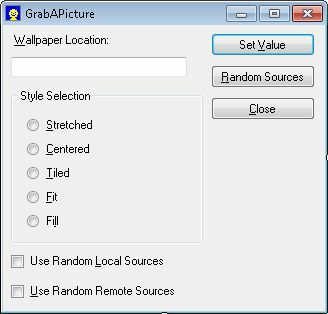 Last week’s post, Improving the GrabAPicture Application (Part 3), began the process of modifying the forms to accept the special wallpaper settings supported by Windows 7 and newer versions of the Windows operating system. That post also stressed the need to make the forms flexible enough to support older versions of the operating system. The forms actually detect which operating system is in use and modify their appearance to match the capability of the operating system. This week you’ll see the code used to make the new settings work properly. Of course, these two posts together support the second objective outlined in the Improving the GrabAPicture Application (Part 1) post. The underlying code is less critical when it comes to detecting the operating system because the form already performs this task. The user can’t select an option that doesn’t work with the selected operating system if the forms don’t make that option available. Consequently, a lot of the changes in this example are straightforward. The first change is to extend the Styles enumeration initially discussed in the Exploring the GrabAPicture Application (Part 5) post as shown in the following code.
' A list of wallpaper display styles. Notice that I add the new options after Unknown to ensure that they don’t inadvertently affect any of the application code. Some developers might be tempted to add the options before Unknown, but this would be a mistake because you can’t be absolutely certain about potential side effects of doing so. Now that you have the right enumerations available, it’s time to modify the code that relies on the enumerations. Before you can do anything though, you need to determine what values to provide for the two new enumerations. 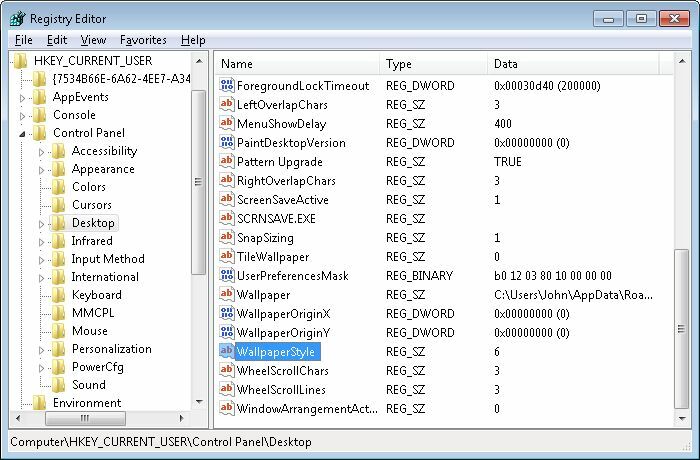 Remember that in the Exploring the GrabAPicture Application (Part 7) post that the HKEY_CURRENT_USER\Control Panel\Desktop registry key WallpaperStyle value contains the information you need. When you set the desktop to use the Fit style, this value becomes 6 as shown here. Setting the desktop wallpaper to Fill changes this value to 10. Consequently, the first change you need to make is to the Style() property (discussed in the Exploring the GrabAPicture Application (Part 7) post) as shown here.
' Get the desktop key.
' Obtain the current value.
' Windows 7 and above-specific values.
' registry keys as needed.
' Provide Windows 7 and above-specific values. All of the required changes are marked with comments so you can find them easily. In all cases, it’s simply a matter of making the right registry changes. The behavior of the code remains unchanged. During testing, I found that if the value of the WallpaperStyle registry setting is set to either 6 or 10 on a Windows XP system, Windows assumes you mean stretched (the option normally associated with a value of 2). Testing on a Vista system shows the same thing happens. I’ll be interested to hear from readers whether this is the case on their systems. If not, the example may very well need to include additional operating system-specific code for the Style() property. There is one place where things can get incredibly messy, and that’s with the command line interface. 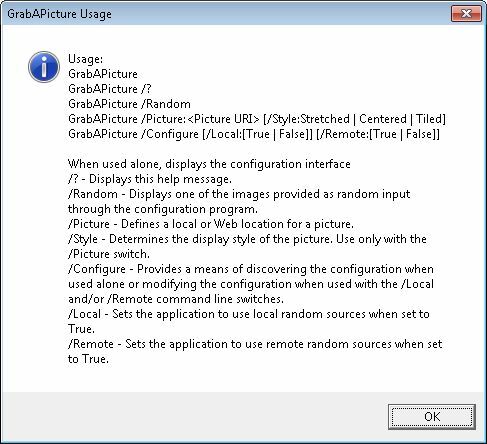 The Exploring the GrabAPicture Application (Part 9) post describes the command line interface in detail. In addition, you’ve already seen on update to this interface in the Improving the GrabAPicture Application (Part 2) post. In order to add the new Windows 7 functionality to the command line, you’ll need to perform another update of it that includes operating system version checking similar to the checking provided for the forms. For now, we’ll leave the command line interface alone and save this update for another time.
' Number of settings to randomize.
' The selected image number.
' Contains the wallpaper location.
' Initialize the stored settings.
' Verify that there are settings to use.
' Obtain the number of settings to randomize.
' Determine the number of settings.
' Obtain the style and location.
' Choose the wallpaper style.
' Add the Windows 7 and above-specific options.
' Create a wallpaper URI.
' Subtract the local resources.
' Set the wallpaper location. All of the Windows 7 additions are marked with comments. The code simply ensures that the stored settings are handled appropriately. There isn’t any change in command line syntax or behavior with these changes. The majority of the changes for this update appear in frmMain. The only way to accomplish the task is to go through the code one step at a time. The first change appears in frmMain_Load(), which was originally discussed in Exploring the GrabAPicture Application (Part 10). The Select statement needs to be updated to ensure that the form loads with the controls configured correctly as shown here.
' Get the current wallpaper style. You must also add event handlers for the Fit and Fill radio buttons on frmMain. These event handlers as similar to those discussed for the other radio buttons as shown here.
' Set the new style. The two Select buttons on frmConfigure (discussed in the Exploring the GrabAPicture Application (Part 11) post) require modification to work with the new options. When a user clicks Select, the code configures the Desktop with the newly selected wallpaper. The updates merely make it possible for the configured sources to contain the new fit and fill options. The code for the local resources version of the Select button appears here.
' 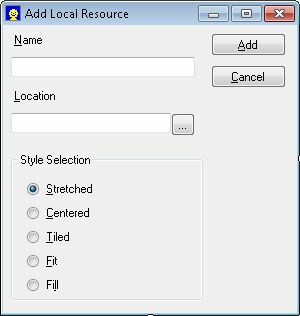 Add the Windows 7 and above-specific Styles. The remote version of the Select button code appears here. The final set of changes for this update is to frmAddEdit, which is discussed in the Exploring the GrabAPicture Application (Part 12) post. It’s important to remember that unlike frmMain, the radio buttons on this form don’t have any event handlers. The settings are handled in a different way in the code. The first set of changes appear in frmAddEdit_Load() to ensure that the form is configured correctly when the user opens it as shown here.
' Set the form up for editing.
' Make sure you use the correct database. The second set of changes occurs in the btnAddEdit_Click() event handler, which determines what happens to the user selections when the user closes the form (no matter what the button caption might say at the time). Here are the changes for this event handler.
' Change the array data.
' Add a new array element.
' Instantiate a new array item.
' Add the data to the array. As you can see, the new options work precisely the same as the existing ones. When the user adds or edits a local or remote wallpaper, the code makes the appropriate changes to the stored settings. If you compile your application at this point, you’ll find that you can now work with the Fit and Fill wallpaper settings in Windows 7. These settings will also be available when you move your application to Windows 8. All of these code changes come down to one thing really. The new settings involve additions to the WallpaperStyle registry settings: 6 for Fit and 10 for Fill. Let me know if you have any questions about these changes at John@JohnMuellerBooks.com. Fit: The graphic is resized to fit within the confines of the display, without modifying its aspect ration (as stretch will do). Fill: The graphic is resized to completely fill the confines of the display, even if this means chopping off part of the graphic, without modifying its aspect ratio. Change the frmMain.Size property to 328, 317. Change the cbRemote.Location property to 8, 256. Change the cbLocal.Location property to 8, 224. Change the GroupBox1.Size property to 192, 148. Change the cbRemote.TabIndex property to 11. Change the cbLocal.TabIndex property to 12. With this in mind, you must modify the frmMain_Load() method by adding some code to the beginning of the method. This code checks the operating system version and then makes changes as shown here to return the application appearance to its original condition (you originally saw this code in the Exploring the GrabAPicture Application (Part 10) post).
' Detect the operating system version.
' Disable the two wallpaper and make them invisible.
' Change the properites back to their old configuration. When GrabAPicture runs, it displays the appearance that best matches the host operating system. It’s important to disable the rbFill and rbFit controls so that the user can’t access them accidentally. In addition, you make them invisible so that the user can’t see them either. Notice that the If statement relies on an Or condition because either value could trigger the code. For example, Vista is version 6.0, so it would trigger the code because the Version.Minor value is 0. The changes you make to frmMain also apply to frmAddEdit. However, this form is less complex, so the changes are less extensive. Follow this procedure to make the changes to the form. Change the frmAddEdit.Size property to 300, 316. Change the grpStyleSelect.Size property to 192, 148. You’ll need to add code to the frmAddEdit_Load() method to change the user interface back to it simpler form when the user has an older version of Windows. As before, add the following code to the beginning of the method (you originally saw this code in the Exploring the GrabAPicture Application (Part 12) post). As before, the code checks the OS version and makes a decision about whether it can use the new features. If not, the form is configured to allow for the older wallpaper setup. This is a good stopping point for this week. Next week you’ll see how to finish this particular update. You’ll need to modify the underlying code to allow use of the new settings. However, there are a few surprises in this area—things you have to discover by looking at the registry. In the meantime, let me know if you have any questions about this part of the change at John@JohnMuellerBooks.com. You can see the next post in this series at Improving the GrabAPicture Application (Part 4). Administrator configuration needs: The administrator may be able to provide input on precisely which tasks the application will need to perform remotely. Remote tasks are usually good candidates for command line support. Application complexity: When working with a simple application, you have the luxury of including all of the configuration options at the command line. As applications become more complex, you must pick and choose command line features. Using multiple levels of command line switches also becomes a requirement. As an example, look at the WMIC command line utility. Application type: The tasks that the application performs partially dictate the command line interface. An application designed for management tasks (such as WMIC) will require a more robust command line than one used for localized data handling (such as Notepad). The new option, /Configure, displays the current configuration when used alone. Adding the /Local command line switch changes the Use Random Local Sources setting, while adding the /Remote command line switch changes the Use Random Remote Sources setting. Add the frmMain-specific code required to perform tasks. With these steps in mind, lets begin with the help information. The following listing shows the updated help code in bold.
' User is requesting help.
' Create the usage instructions.
' Work with the application configuration.
' Obtain the current settings.
' Check to make sure there are settings to use.
' Tell the user there are no settings to display.
' Display the settings information.
' There must be at least one settings argument.
' Create a variable to hold the current argument.
' Create a varible to hold the new value.
' If there aren't any settings.
' Process each settings argument in turn.
' Obtain the switch and argument.
' Verify that the user has actually included a value.
' Check for a local setting.
' Check for a remote setting. This code begins by checking for the /Configuration command line switch. If the user has included it, then the code checks the number of command line arguments. When there is just one argument, the user has used the /Configuration command line switch alone, so the application displays the current configuration information. In order to perform this task, the code must create a GrabAPictureSettings object, CurrentSettings, and load the settings into it. At this point, displaying the information is simply a matter of accessing the current information in CurrentSettings. Make sure you convert the Boolean values to strings. Setting the configuration is only a little harder. The first thing to consider is that you don’t know whether the user has included just the /Local or /Remote command line switches, or both of them. In addition, you have no idea of which order the user has used for the switches. As a consequence, this application relies on a For loop that doesn’t assume anything. It simply grabs the first switch and then processes it. The command line switch is supposed to be followed by a colon (:) and then a value. Unfortunately, the user could provide anything as input. The code begins by verifying that the user has provided a switch and value combination (or at least the right number of arguments). It then checks for either /Local or /Remote. The value could still be incorrect, so the application uses the Boolean.TryParse() method to convert the input to a Boolean value safely. If everything works out correctly, the application makes the setting change and saves the result to disk by calling GrabAPictureSettings.SaveSettings(CurrentSettings). With these changes, the application can now set the configuration from the command line. Next week you’ll see another new addition. In the meantime, let me know if you have any questions about this update at John@JohnMuellerBooks.com. We’re finally down to the last baseline post for the GrabAPicture application, frmAddEdit, which is the chameleon form. The Exploring the GrabAPicture Application (Part 11) post describes how the frmConfigure code modifies the appearance of the code for this form so it can perform several tasks. At the center of this capability are several versions of the constructor that allow for different configuration techniques as shown in the following code.
' Change the add/edit button title.
' location field as needed. As you can see, each of the constructors provides one more level of configuration. You might wonder why the application doesn’t simply use the most configurable of the four constructors, but this approach has some disadvantages. Using just a single, complex constructor makes the application inflexible. The developer would also need to provide the default values for title, button, and remote editing capability, even if these values didn’t change from the default dialog box. Adding this requirement would make the application more susceptible to errors. Using four different constructors also forces the developer to consider which entries actually do need to change. Giving someone the opportunity to think application design through is never a bad idea. Notice that the fourth constructor contains special code for removing the browse button from view when working with a remote resource. The browse button wouldn’t do the user much good in this case and clicking it can only cause problems. Most of the code for this form is straightforward, albeit a bit convoluted at time due to the form’s multipurpose nature. The following sections describe each of the coding areas. This form is used in a number of ways, so it’s important that the application be able to track the form’s current state. Otherwise, the application could make an assumption about the form content that isn’t correct. The best way to provide state information outside of the form is to use properties. Relying on properties makes it possible to monitor and control interaction with form state information in a controlled way. The application uses the properties shown here.
' Private variables used for editing purposes.
' Tracks the current list of local resources.
' Shows whether edit is for a local or remote resource.
' Determines whether this is an add or edit action.
' Defines the edited record.
' Verify the input is positive.
' Perform separate checks for local and remote.
' Set the record number. Resources: Defines a local URI. RemoteSources: Defines a remote URI. IsRemote: A read-only property that the application can use to determine whether to access the Resources or RemoteSources property for the current URI. IsEdit: Controls whether the dialog box provides an adding or editing appearance. The adding dialog box is blank, while the editing dialog box contains the current local or remote record information. RecordNumber: Contains the record number of the current local or remote source. Form loading is important because the code in this area controls the initial appearance of the dialog box. A form used for adding a new record, whether local or remote, is always blank, so it doesn’t require any custom configuration. However, if the form is used to edit a current record, the form loading code must detect whether the form is editing a local or remote resource. In addition to URI differences, local resources have an additional button available for browsing the local hard drive. The following code shows how form loading works. As you can see, the first thing the code detect is whether the form is using for adding. If it is, then the application doesn’t do any configuration. When the dialog box is used for editing, the application checks the status of _IsRemote to determine how to configure the dialog box. The code obtains the correct record and then displays the information on screen. There are three user controls, but you only need to provide code for two of them (btnCancel provides the default action when clicked). The Add/Edit button (btnAddEdit) is always visible. The relies on it to make any changes permanent. 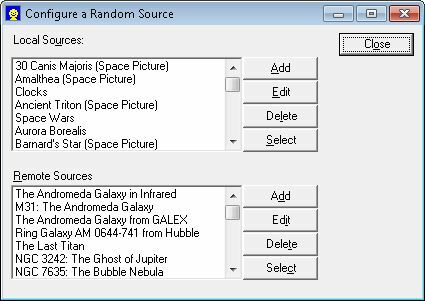 The browse button (btnGetResource) is only available when working with a local resource. The user relies on this button to locate resources on the local hard drive. The following code shows how these buttons work. Let’s discuss the simple button first. When the user clicks the browse button, the application displays an OpenFileDialog control, OFD. If the user selects a file and clicks OK, the code places the name of the file into txtLocation.Text. Theoretically, a little customization would make this dialog box friendlier, but it works well as presented. The btnAddEdit_Click() event handler is a little more complex. It actually performs one of four actions depending on the dialog box options. Edit/Remote: The code changes the record information found in _RemoteSources for the current record pointed at by _RecordNumber. Edit/Local: The code changes the record information found in _Resources for the current record pointed at by _RecordNumber. Add/Remote: The code either creates a new _RemoteSources array or adds an element to the existing _RemoteSources array. In both cases, the code adds the new record to the end of the array. Note that because the array is zero-based, you must subtract 1 from the array length in order to find the last record of the new array. record to the end of the array. Well, now you have the full story on the base application—the application I started with. The next post will discuss some of the additions we’ll pursue in the new year. For now, please keep those comments coming. Let me know if you have any questions at all about this form at John@JohnMuellerBooks.com. The previous post in this series, Exploring the GrabAPicture Application (Part 10), discussed frmMain, which allows the user to perform application configuration and manually configure the Desktop wallpaper. The focus of this application, however, is automated configuration, which is the purview of frmConfigure—the topic of discussion today. The user relies on frmConfigure to add, edit, delete, and select either local or remote graphic sources for the Desktop wallpaper as shown here. The first task is to load the current database. In this case, the application creates and configures a global variable that provides access to the preconfigured wallpaper choices as shown here. The global variable, CurrentSettings, is of type GrabAPictureSettings. The application begins trying to fill CurrentSettings by calling GrabAPictureSettings.LoadSettings(). When this is the first application use and the user hasn’t added any wallpaper yet, the result of this call is that CurrentSettings equals Nothing, so the application creates a new database by creating a new GrabAPictureSettings database. When there are settings to use, the application must determine which settings are available. The database may only contain local or remote settings, but not both. The next step determines whether CurrentSettings.LocalUris contains Nothing. If there are local settings, the application places the name of each of these entries in the lstLocal list box. The application performs a similar task for the remote settings. As a result, the user sees the names of all of the available local and remote wallpaper sources when the application dialog first appears on screen.
' Create a form to add the record.
' Set the resources when available.
' the settings database and display it on screen.
' Make sure the user has selected an entry.
' Create a new form for editing the data.
' Make sure there is data to edit.
' Provide the records and choose the one to edit.
' database and show changes on screen.
' Create a temporary record array.
' Remove the requested record.
' Add the record if it doesn't match the target. Let’s look at each of these event handlers in turn. The btnLAdd_Click() event handler is the simplest of the group. It begins by creating a new frmAddEdit using the default constructor. When there are local resources to provide in CurrentSettings.LocalUris, the program supplies them to the AddItem.Resources property. At this point, the application displays the dialog box. 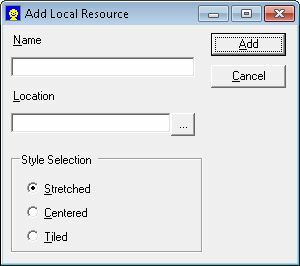 If the user clicks Add, rather than Cancel, in the Add Local Resource dialog box (which produces a return value of DialogResult.OK), the application obtains the updated list of resources from AddItem.Resources and places them in CurrentSettings.LocalUris. The application then saves the database by calling GrabAPictureSettings.SaveSettings() with CurrentSettings. Finally, the application displays the newly added item in the Local Sources list. The application has to make two decisions when editing a record. First, it has to check whether there is a record to edit. If there aren’t any records, the application displays a dialog box stating as much and exits. Second, it must determine which record to edit. The code passes the value in lstLocal.SelectedIndex onto EditItem.RecordNumber. As the application is currently configured, the contents of lstLocal must precisely match the contents of CurrentRecords, which means that lstLocal remains unsorted. A future update will make it possible to sort the list, if desired, but for now, the application is designed for simplicity of understanding, rather than aesthetic appeal. The remainder of the btnLEdit_Click() code works just like the btnLAdd_Click() event handler, with the result that any changes are immediately saved to the database. Deleting a record means checking for the required record in the database by name and then removing that particular record. The btnLDelete_Click() event handler begins by checking whether the user has actually selected a record (lstLocal.SelectedIndex must equal a value other than -1). It then creates a temporary array, Temp, of type LocalUri, that will hold one record less than the current number of records. The next bit of code may look confusing at first, but all it really does is move all of the records in CurrentSettings.LocalUris that don’t have the name of the selected record as defined by lstLocal.Items(lstLocal.SelectedIndex) to Temp. The result is Temp has one less record than CurrentSettings.LocalUris when the process is finished. The code then copies the new list of records from Temp to CurrentSettings.LocalUris and saves the result to disk. The final step is to remove the name from the Local Sources list. Selecting a specific local source is relatively straightforward. The btnLSelect_Click() event handler begins by creating Wallpaper, which is type WinWallpaper. It’s important to remember that modifying the Wallpaper object automatically changes the Desktop wallpaper. You saw how this works in the previous post and it works the same here. The application relies on the index provided by the user’s selection, lstLocal.SelectedIndex, to select the correct wallpaper in CurrentSettings.LocalUris. The application then sets the wallpaper style and provides it with a location in the form of a Uri object, NewUri. The result is that the user sees the selected wallpaper on screen. The code for managing the remote database resources is almost precisely the same as the code for managing local database resources. In fact, the modifications are mainly cosmetic, such as changes to the frmAddEdit title and button text. However, there are a few distinct differences to note as shown here. Of course, everything is done using CurrentSettings.RemoteUris in this case because you’re working with the remote settings. In addition, every one of the dialog boxes uses the most complex frmAddEdit constructor, which configures the application for a remote source. I’ll leave it to you to explore this code based on the conversation of the local source workings. Well, that’s it for frmConfigure. The next post will complete the basic application. We’ll look at how frmAddEdit works. In the meantime, feel free to contact me about any questions at John@JohnMuellerBooks.com. I’ll also start entertaining some additions to this basic application. I have a few in mind, but I’d love to hear your thoughts on the subject. You can find the last post in this series at: Exploring the GrabAPicture Application (Part 12).